All around the world nationalistic movements have arisen out of historically rooted ethnic differences. The recent referendums and uprisings paint this phenomenon as an issue that is exclusive to the 21st century, but they are far from that. These contemporary issues that are creating strife among nations and cultures are drawing attention away from one of the most unrelenting and unresolved conflicts of this nature: Israel and Palestine. The conflict and resolution between the two “nations” can set a precedent for all of the issues concerning independence that are surfacing, if it is ever resolved correctly. The general stigma surrounding the conflict is of an epic war of religions: Muslims versus Jews. However, portraying the issue as religious in nature makes it intractable and ultimately implies there will never be a viable solution. 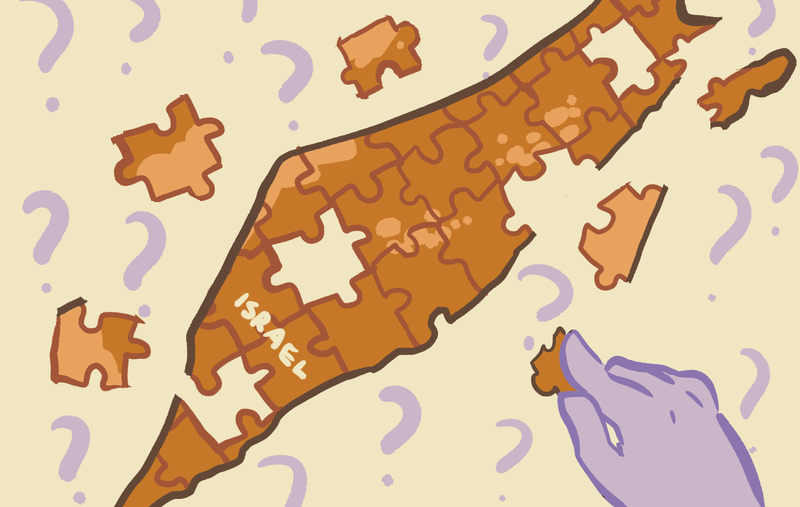 The issue is exclusively between two nationalistic identities that formed in the early 20th century, both calling for their own state in Israel. The Israel that exists today is the product of many wars, treaties and border re-drawings with Palestine and their Arab neighbors. The byproduct of this leaves the “state” of Palestine confined to the Gaza Strip, the West Bank and the hotly contested East Jerusalem. A nation extending its borders and acquiring land through war isn’t unheard of and is fairly common among the established nations of the world. However what is new is the concept of acquiring land in a post-war peace through civilian settlements in enemy land that “necessitates” security provided by the military. Israel has done just that, which has created a pseudo-military occupation of Palestine. In this occupation the Palestinian people have suffered more than their government. They have become second-class citizens to Israelis in their own land. With water rights being stripped from them along with their homes, the conflict has become a humanitarian crisis that has generated 4 million refugees in diaspora. In normal instances of this occurrence, Israel would be condemned for their obvious illegal actions, but nothing about this situation is a normal occurrence. Due to the fact that Palestine isn’t necessarily an internationally recognized state, they are not protected by an international law that would have been violated by Israel’s actions. Most solutions to all of these complications are categorized to be one of three things: a “two-state solution” in which both nations coexist, a “one state solution” whereas Israel gains full control of the region or a “one state solution” in which Palestine has full control of the region. A two state solution is the only path to peace seeing that both sides will not cease violently protesting the other’s claim over land that the first may occupy. In this newest birthing of nations we are witnessing in the 21st century sizable ethnic groups are granted the right to self governance, so Israel and Palestine should be no different. The first step towards a successful “two state solution” would be the recognition of Palestine as an independent, sovereign nation. Only then can Israel be held accountable for their illegal occupation of Palestinians’ land and the efforts towards peace truly start to begin. At the end of the day this issue is that of a group’s right to self determination and self governance. If an agreement is to be reached and peace be made, its effects will resonate throughout the Middle East and across the world.